Marong Shire (1864-1994), immediately west and north of Bendigo, was proclaimed on 23 December 1864. Its western boundary was the Loddon River and its eastern boundary enclosed Kangaroo Flat which after World War II had a population of about 1000 persons. By 1990 Kangaroo Flat had an estimated population of about 10,000, thus giving the shire a pronounced urban component. Accordingly the shire was proclaimed a rural city on 1 October 1990. Marong shire had a mixture of agricultural districts, eucalypt forests and mining localities. There was gold mining at Maiden Gully, Wilson’s Reef near Marong, Neilborough and Sebastian. 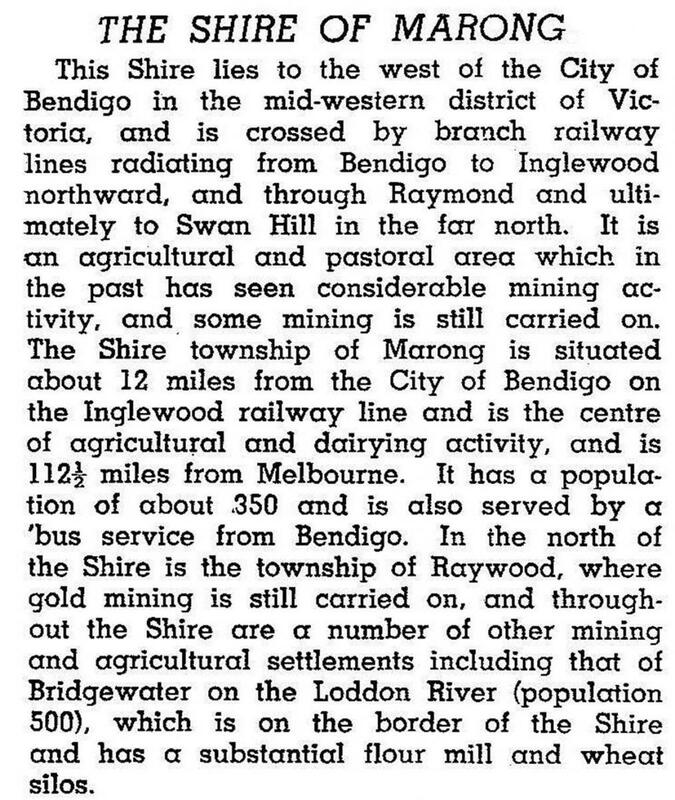 The mining borough of Raywood was united with the shire on 1 October 1915. Lockwood was the shire’s administrative centre until 1908, when the centre was transferred to Marong. Marong municipality was served by two railway lines from Bendigo: north-westerly to Bridgwater-on-Loddon (1876) and northerly to Raywood and Pyramid Hill (1882). The Calder and Loddon Valley highways run generally north-west through the former municipality, through undulating to flat terrain, suitable for cereal growing and grazing. South of the Calder Highway the land is undulating to gullied. At the far south-west the Laanecoorie Reservoir lies on the Loddon River. In 1994 Marong rural city, with an area of 1489 sq km, had about 9000 cattle, 240,000 sheep and lambs and 11,000 pigs. About 6800 tonnes of barley and 27,000 tonnes of wheat were harvested. On 7 April 1994, Marong rural city was united with Bendigo city, Eaglehawk borough and Huntly and Strathfieldsaye shires to form Greater Bendigo city.